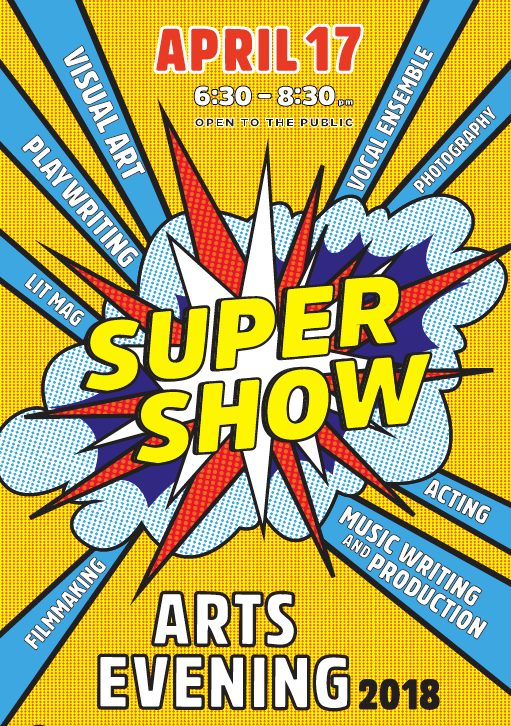 JCHS ARTS warmly invites you to SUPER SHOW! The 14th ANNUAL ARTS EVENING is a celebration of art created in the 2017-2018 Arts Classes. From Music Writing, to Filmmaking, to Studio Art, to Playwriting, to Acting, to Sculpture, to Photography – JCHS students CREATE!!!! Please come be a part of the celebration. The evening is free and open to the public from 6:30 – 8:30pm on Tuesday, April 17th. With sensitivity to diversity of religious practice, we want community members to know in advance that there will be live music and vocal performances included in the evening’s programming.